I previously posted an article Automatically Post Blog Entries to Facebook Page by Network Blogs. Today we will be doing the same procedure for Twitter. Social Networks are of great importance for a blog's growth. There are so many people that are attracted to a certain blog after seeing those post entries on their profiles. I take updates from Mashable quite frequently and my Facebook profile always gets tons of Mashable content. And believe me i read most of them. So it's quite important to post your blog's content on those social networks quite frequently. So lets see how we can add our blog's feed to Twitter. 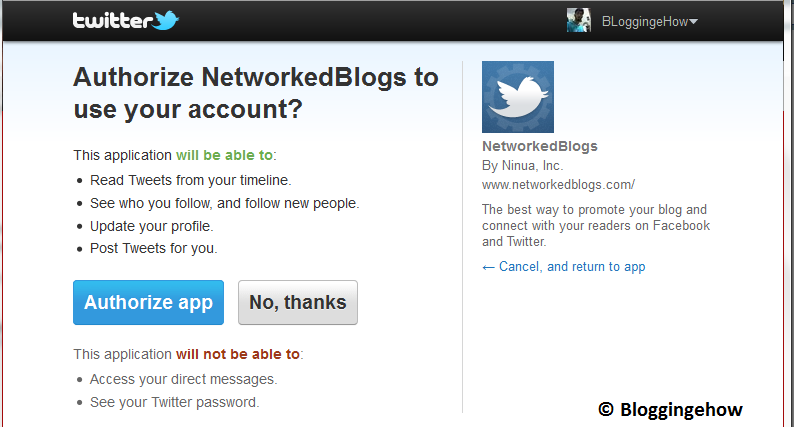 For this we will be using a free application called Networked Blogs. If you don't have an account there, please read the post i mentioned above. For now i'll be considering that you already have a Facebook listing in Networked Blogs or you at least have an account there. 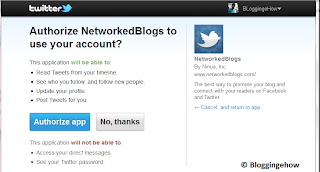 Go to your Networked Blogs profile >> Syndication. Once you are in syndication, it will ask you for your blog for which you want to manage syndication. Choose your blog. Now click "Add Twitter Target". It will ask for authorization for Twitter account. Click Authorize App.